Today's card is very simple and graphic. 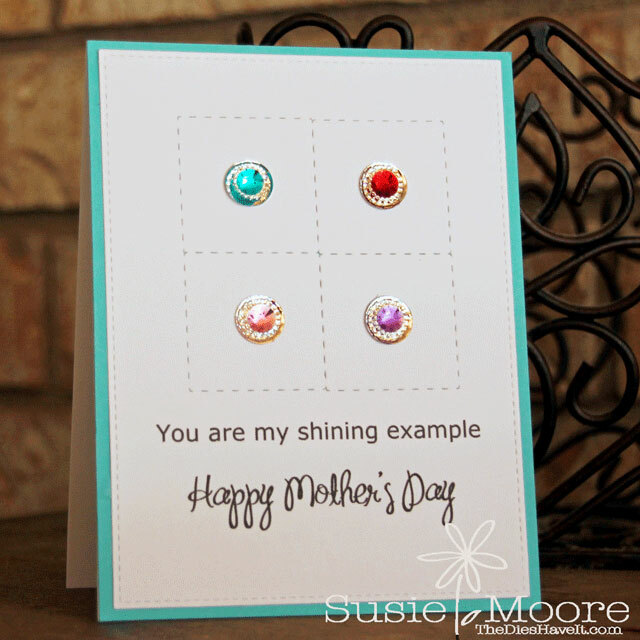 I really wanted the lovely new Eyelet Outlet bling to be center stage on this card. These beautiful clear edged 12mm Self Adhesive Jewels come in the following colors combination packs: pink & red, green & aqua, purple & blue, and clear. It was super hard to choose just four colors for my card! I love that these jewels have plenty of adhesive on the back. No need for any extra at all! I typed my sentiment since I didn't have a stamp saying just what I needed. I think this is the perfect solution for more unique sentiments. I hope you like this card. I will be back tomorrow with another Mother's Day card for you.